Resident advisor silver graduation stole Silver One Side Embroidered Graduation Stole Made of high quality red bridal satin Arrow pointed edges Shape made to fit for all body types Each side is 30.5" long and 5.25" wide Fully lined throughout This Silver One Side embroidered Stole is the ideal item for honor recognition for your graduation Start customizing your graduation stole. Pick your color of stole from drop down box, and then write down embroidery color what you want embroidered (such as "Class of 2015" and your Organizations name in special instruction box. You can also Email us images and other details . 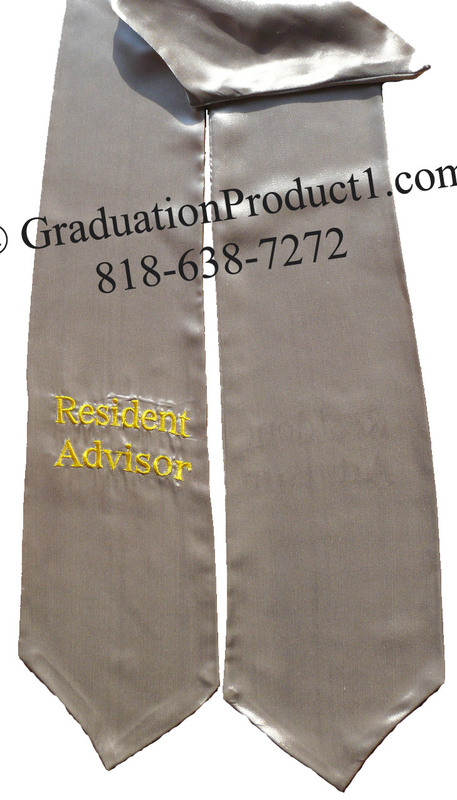 The amazing low priced, embroidered graduation honor stoles are stylishly made from light bridal satin and shaped to fit all body types. Fully lined throughout the high school / University graduation stole measures 30.5" long each side and 5.25" wide and has neat arrow pointed edges. Graduation Product is happy to offer the amazing discount high school / University graduation honor stoles to celebrate your graduates achievements. Check out the huge savings when ordering in bulk.